Wylo is very special. She is a Seabird, an old design going back to the 19th century. There were many Seabirds built during the first half of the 20th century. Harry Pidgeon built Islander, his Seabird during the 1920's. He extended the hull to 34 ft. His boat was famous as he sailed her around the world twice single-handed. Islander got lost on the rocks during a storm in 1946. Wylo is a copy of Islander. 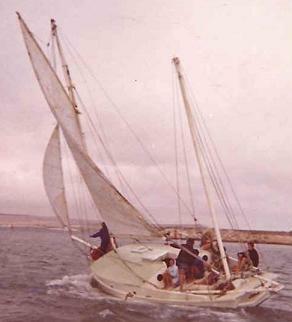 Frank Wightman built her in 1938 and sailed her across the Atlantic Ocean. Her hull is identical to Islander. The only difference is that Frank extended the coach roof right across the deck, whilst Harry Pidgeon kept the more conventional catwalk.